Thanks Russel, You Deserve a Break. One of the reasons why I am a member of the Green Party is because our values and policies always come first and we try to avoid engaging in personality politics. Facilitating change is more important to us than chasing power alone. Interestingly because we are not reliant on our leaders to carry the full weight of our Party's fortunes we tend not to sack them so readily and this has provided us with a high level of stability. Over the 25 years of our party's existence we have have only had four leaders (under our co-leader system), while National has had five and Labour seven. 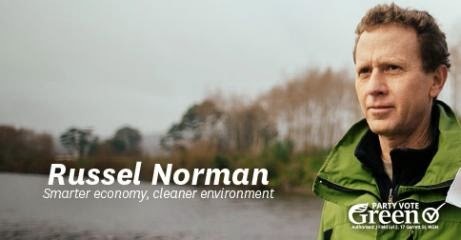 Russel Norman's announcement today that he is stepping down from his co-leader role from May was another example of his measured and thoughtful approach to politics. Russel has devoted nine years to the position after stepping up when Rod Donald died unexpectedly in 2005. He had waited to announce his resignation until after the Summer break to ensure he had space to properly reflect on his decision and he has provided ample time for a new leader to be elected and be embedded in the role before the 2017 election. Russel's remarkable discipline has seen him successfully negotiate through almost a decade in one of the most tumultuous and unforgiving environments, despite some personal challenges. He has always been very protective of his private life and few realize the stresses that he was having to manage while presenting a composed public image. His partner, Katya, was diagnosed with a brain tumour early in his leadership and since her recovery they have had three children. Russel takes his role as a parent just as seriously as his parliamentary one and anyone who has had young children know what an important (in a developmental sense) and demanding time that is. When Russel joined Jeanette Fitzsimons as co-leader in 2006, the Green Party of Aoteatoa New Zealand had managed to just get over the 5% threshold in the 2005 election and had dropped almost 2% in voter support since 2002. Many political commentators were predicting the slow demise of the Greens and didn't believe that Russel could replace his charismatic predecessor. History has proved otherwise as Russel worked hard to provide the economic depth and credibility that had been lacking previously in public perception and ballot box support has grown every election since. The Greens now experience more than double the support of 2005, membership levels have never been higher and we have often been considered the most effective opposition party over the last two terms as Labour has worked through many leadership and organisational changes. My personal knowledge of Russel has developed through hosting him on his many visits to the south, and mainly when he was focusing on his Dirty River tours. On each occassion Russel wanted to engage with scientists, farmers and local politicians to gain first hand knowledge of the issues that were effecting each river or freshwater environment. He also relished the opportunity to get into a raft or kayak and experience the natural ambience of the river and any damage first hand. Russel's passion for our rivers was obvious and his description of them in one impromptu speech as being the "last wild places in a much altered landscape" has stuck with me since. Time and time again he has managed to express Green values and thinking in a concise and articulate way and I often find myself referring to his many speeches as a useful guide to how we should be communicating our policies and values to others, especially around economics. In many ways there must be some relief to Russel in shifting out of the public scrutiny that has been applied to him for so long. Russel recognised that if the Greens wanted to present an image of a party ready to govern we had to look the part in a traditional sense. He always tries to present himself in a professional manner despite the fact that he quickly resorts to a T Shirt, jeans and jandals at every opportunity. Russel is also known for his impish sense of humour and yet, despite his discipline, it has bubbled out in unusual circumstances. The time he attempted to get the Prime Minister to answer a question that was directed at him, but continually fobbed off (as he is apt to do) led to his memorable "chicken" response. Surprisingly, one of the most viewed parliamentary videos is Russel's 2011 'Christmas' speech where he talked about a need to return to core Christian values. After Russel's announcement I am not expecting the same sort of media hysteria that we have experienced when Rod died and Jeanette resigned. We have had a long enough track record to prove that our change processes are very sound and, because of our co-leader system, Metiria can easily take up the slack as any incoming person settles into the role. We manage our leadership change like a tag team in sport, we have a number of players ready to step in so that the game can continue with a high level of energy and continuity. Russel has had a long successful innings and deserves a break. Thank you Dave for such a good account of Russel's term as leader and for the links to some valuable times. We ought not to expect our leaders to sacrifice time with their families or time for themselves. 9 years is a generous gift of oneself to the nation and to the country. I am sure Russel and the Green Party will gain respect of what has happened today. I hope so Pat. It is nice that both Jeanette and Russel have stepped aside under their own terms, this rarely seems to happen with other parties. Russel's focused questions to the Prime Minister in the House forced Key to reveal himself as a petulant bully. Made the Speaker look like the partisan clot he is too Though Russel grinned his way through it, all that dissembling and stonewalling from people like Key, English and Joyce who have lost their moral compass altogether, he must have found it tiring and frustrating. His politics served as a clear contrast to the corrupted version employed by those people. RMA Changes, A Wolf in Sheep’s Clothing?